Yesterday’s freakishly warm temperatures aside, September has been a fairly quiet month for the garden because of the very cool temperatures. The tomatoes are nearly done, and the chilies and peppers are taking their sweet time ripening in the cold. There are still some leeks on the go; I’ll leave them be until we get some frost. Earlier in the summer I picked these Dragon’s Tongue Beans. Unfortunately I think I kind of screwed up on these. I had been wanting to eat them as snap beans but the ideal time for that was while we were away on our Wabakimi trip. Having never grown beans for drying before, I think I picked them a little too early. 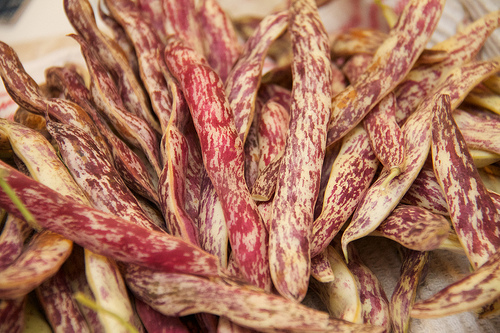 The beans that I got from these are wrinkled and immature looking — not shiny and plump like you would expect dried beans to be. Better luck next time I guess. They sure are pretty things though! I relished this summer in my fetish for fresh beets. 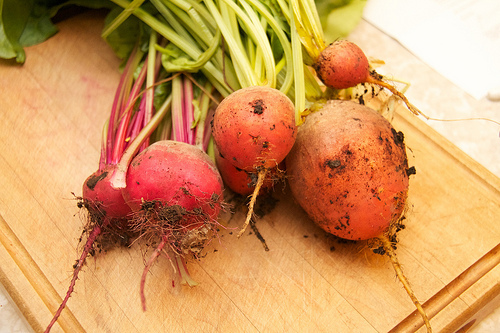 I grew a couple varieties of golden beets — Touchstone and Detroit Gold. I didn’t mark them so well so I didn’t really track which did better, but one of the varieties noted that they have a low germination rate. I would say that was true because I didn’t get quite as many of them as Chioggias or the Detroit Reds or Bull’s Blood varieties that I grew. Most of those I pickled. The Bull’s Bloods had a rather rough, almost stringy texture to them, not the solid root vegetable texture you usually see from a beet. Not sure I’ll grow them again. 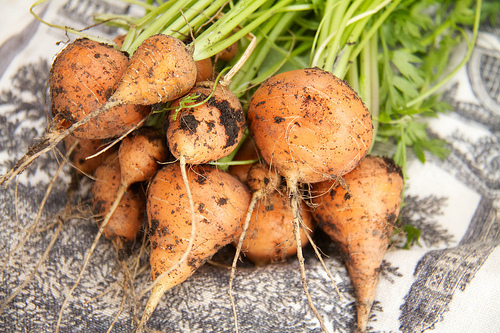 I grew the Chantenay carrots again and they offered up great yields. But I also tried these super adorable Tonda di Parigi carrots. They didn’t yield a huge crop, but that’s okay. I’m very pleased to report that our rickety, falling down porch is being repaired finally. It wasn’t looking very likely that it was going to be done in the near future, but then we found a contractor working on one of our neighbours places and talked to him, and he offered us a dramatically better rate than anything else we’d seen. The old broken concrete stairs are gone, and they’ve pulled up the horridly weed-infested interlock walkway. The new stairs will be as wide as the porch so I will loose a bit of flower beds and herb garden space, but the flower beds around the house are badly overgrown (again) and need some TLC, this is as good of a reason as any to reinvent them. We also have to adjust the grade of the beds in relationship to the house anyway. I’m very excited to be able to decorate the porch/stairs with potted plants next year. If I can get to it before the cool weather really takes hold, I need to try to re-stain/seal the edges of my raised beds. I discovered that Costco sells raised bed kits made with composite recycled plastic and ‘wood flour.’ Wish I’d known about these last year — they would have been cheaper and for certain they would have lasted longer. Composite timbers like that are pricey to begin with, but in this kit they are pretty affordable.